The original Dennis Dart was introduced in the early 1990's, various bodybuilders produced their own body designs, however the Plaxton Pointer was by far the most popular choice. The small Darts proved ideal for expanding services in the new de-regulated industry, many replaced the early "bread van minibus's" introduced in the mid 1980's. The original Dennis Dart was replaced by a new low floor version towards the end of the 90's, the Dart SLF with Plaxton Pointer body still remains in production and has become a familiar site across the UK. The OOC model was introduced in January 1997 and over the next two years 14 releases were made, there haven't however been any new releases since March 1999. 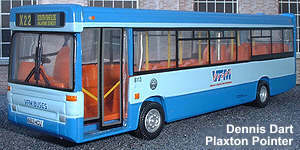 See also the low floor Dennis Dart SLF Plaxton Pointer. Click the catalogue number to view the related model details & larger pictures.